Lewis, Donna Edwards, Elizabeth Esty, and other Democrats promise to keep demanding action on gun violence. 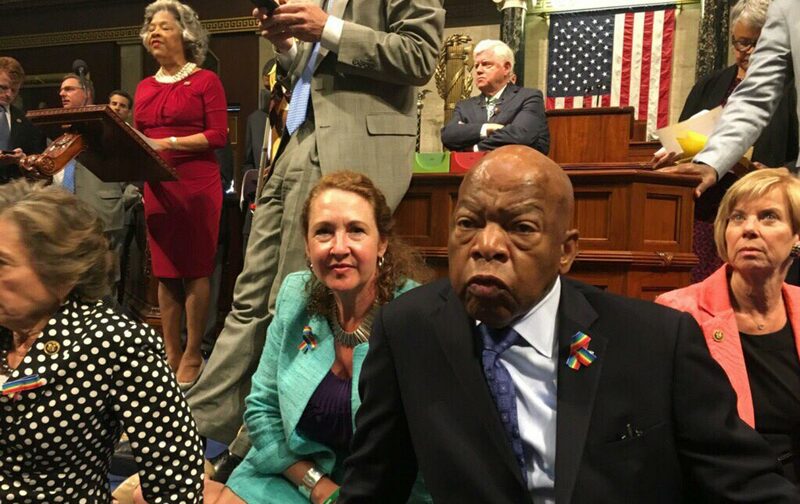 Representatives Elizabeth Esty and John Lewis occupy the House floor. Photo tweeted by Representative Elizabeth Esty (@RepEsty). In a sign of how dramatically the debate about gun violence in the United States has changed since the June 12 Orlando massacre, Democratic members of the House of Representatives occupied their chamber’s floor from mid-day Wednesday through early Thursday morning for a sit-in that demanded the Republican-controlled House take up meaningful legislation to address the crisis. Sixteen hours after the extraordinary protest began, with a demand the the House consider gun violence legislation before beginning its traditional summer break, Republican Speaker Paul Ryan brought members of his caucus to the floor and adjourned the chamber for the break in a chaotic final clash with the Democrats. But the leader of the protest, Congressman John Lewis, promised that the struggle was not finished. Indeed, said the Georgia Democrat who has embraced the gun-violence issue with the passion that he brought to his civil-rights activism of a half century ago, a new and more urgent fight for gun control has only just begun. The prospect of further sit-down protests and disruptions of business-as-usual in Washington — where Senate Democrats engaged in a filibuster on gun-violence issues just days ago — now seems very real. “When we come back in July, we will start all over again,” said Lewis, whose bold challenge to Ryan and the Republicans — and to the National Rifle Association and gun-manufacturing interests they represent — confirmed the extent to which Democrats have decided to make gun violence a central issue for their party in Congress and in the 2016 campaign. roughly 30 Democratic members of the House sat down in front of the speaker’s podium and demanded that the House delay the scheduled recess and instead consider gun-control proposals. Congresswoman Elizabeth Esty, a Connecticut Democrat who was among the members who initially gathered with Lewis, tweeted the hashtag #NoBillNoBreak. “Time to occupy the House to demand action. #NoBillNoBreak #DisarmHate,” tweeted Congresswoman Donna Edwards, D-Maryland. More Democrats quickly joined the group, swelling their numbers to roughly 80 by early Wednesday afternoon. One of the members who rushed to the floor was Minnesota Democrat Keith Ellison, who was in a meeting when his scheduler handed him a message that read: “Your mom called and wants you on floor!” Moments after arriving, Ellison tweeted the message that he was sitting in for Birdell Beeks, a 59-year-old grandmother who was killed in a May shooting in north Minneapolis. The unprecedented sit-in halted routine business and left Republican leaders confused about how to respond. The Republicans initially recessed the chamber and cut off C-Span cameras in a move that prevented the sit-in from being broadcast. Twenty minutes later, the Republicans attempted to restart legislative business, but were met with loud chants from Democrats who had gathered in the well of the House: “No bill, no break!” Ten hours later, around 10 p.m. pm, Ryan gaveled the House back into regular session and called for order. But there was no order. Democrats filled the well of the House, holding up sheets of paper with the names of Americans killed by gun violence. That was just one of many points where the Democratic minority grabbed the moral high ground during the course of the most remarkable day in the modern history of the United States House of Representatives. The Democrats also grabbed the attention of America, despite the speaker’s efforts to prevent that from happening. Ryan’s attempt to block the sit-in from being seen and heard failed miserably. The C-Span cameras were shut off each time the chamber recessed. But members such as John Yarmuth of Kentucky and Beto O’Rourke of Texas used their cell phones to spread the word via Twitter and Facebook. C-Span picked up a Periscope feed from California Congressman Scott Peters. New York Congressman Jose Serrano explained what was happening in Spanish. Retiring Congressman Jim McDermott of Washington offered historical perspective. Citizens began to fill the House gallery. Senator Elizabeth Warren of Massachusetts, Tammy Baldwin of Wisconsin, and a number of their colleagues came to the House chamber in solidarity. Outside the Capitol, large crowds gathered to cheer on the Democrats, chanting “Hold the floor!” While their were some disagreements about specific measures — with civil libertarians raising important concerns about proposals to ban gun sales to people listed on an “error-prone and unfair” anti-terror watchlist — there was widespread agreement about the need for Ryan to stop silencing debate on gun violence. We were elected to lead, Mr. Speaker. We must be headlights, and not taillights. We cannot continue to stick our heads in the sand and ignore the reality of mass gun violence in our nation. Deadly mass shootings are becoming more and more frequent. Mr. Speaker, this is a fact. It is not an opinion. We must remove the blinders. The time for silence and patience is long gone. We are calling on the leadership of the House to bring common-sense gun control legislation to the House Floor. Give us a vote. Let us vote. We came here to do our jobs. We came here to work. The American people are demanding action. There is broad agreement among Americans—greater than 90 percent by some measures—that expanding background checks for firearms purchases is a reasonable measure for this Congress to pass. An overwhelming majority also agree that we should enact safety measures that keep guns out of the hands of suspected terrorists. The question before us is, what is this Congress waiting for? Over the last 12 years, gun-related crimes claimed more American lives than AIDS, war, and illegal drug overdoses combined. Since Newtown, tens of thousands of lives have been lost to this deadly crisis. The number of bills that have been debated and passed by this Congress to prevent such deaths is zero. Together we represent families who are worried and frustrated—millions of Americans who are fed up with the inaction in Congress. There is no doubt that our path to solutions will be arduous, but we have to agree that inaction can no longer be a choice that this Congress makes. We cannot enact solutions for families at home if the Speaker will not even allow a debate. Therefore, we stand with thousands of brokenhearted families who have not been served by this Congress, and millions more who are counting on us to find the moral courage to do the right thing. We stand together in our refusal to sit by while this Congress abdicates its fundamental responsibility to protect American families from harm. We urge you to keep the House in session until we have robust debate and votes on expanding background checks and banning the sale of firearms to suspected terrorists.